Let’s face it, unless you’re a vegetarian/vegan, you love ribs. We all do. How couldn’t we!? Tender, juicy, meaty goodness just falling off the bone and melting in our mouths… What’s not to love? But how often do we have them? For most of us the answer is most likely “rarely”. Maybe you’ll make them once or twice in the summer, and probably have at least one family BBQ where an uncle considers himself a pit boss and will make up a batch that has his super secret sauce or rub. But that’s about it. So why is it that we all love these things, but barely ever have them? Because good ribs take FOREVER. It’s not a meal, it’s a marriage. You have to marinade them for no less than 24 hours, ideally 48 hours, then cook them low and slow for the better part of a day. When I used to make my baby back ribs I’d have them in the oven by 9am and the grill by 1pm to serve them by 5pm. And that’s after they spent two days marinating in my fridge. But that’s what you have to do to have great ribs… isn’t it? No, it isn’t. At least not always. Yes, if you want some kickass spare ribs, baby backs, beef backs or short ribs, that’s what you need to do. You devote your weekend to them so you can enjoy their juicy goodness for 30 minutes on a warm Sunday night. But it doesn’t HAVE to be that. You can make some juicy, tender, fall off the bone, unbelievably delicious ribs in three hours from package to plate, I swear. Let me introduce you to my new best friend… Country Style Pork Ribs. I got home from the grocery store with three pounds of them the other day at 5pm, and they were on the plate ready to eat by 8pm. Country Style Pork Ribs are big boys. They have a ton of meat on them and normally you would think that they’d take forever to get tender, but they don’t. Why? Because they are heavily marbled, and when you cook them that fat melts into the meat and speeds up the tenderization process tenfold. So here’s what you do. First and foremost, get your oven heated to 300F. Rub down the ribs with whatever seasoning you prefer, and be generous about it. My seasonings vary depending on my mood. The last go around I did salt, pepper, brown sugar and nutmeg for a slightly sweeter style rib. Don’t put sauce on them yet, you’ll do that later. Put them in a baking dish and cover it with foil, and cook ’em in the oven for 2 hours and 15 minutes. Once the time is up pull them out and let them rest at room temperature for 15 minutes. While they’re resting get your grill fired up on low heat. Slather your rested ribs up with whatever sauce you want. I did a brown sugar & aged balsamic sauce, which can be found here (https://perfectpairingsathome.com/2014/06/14/balsamic-and-brown-sugar-ketchup/), but I ramped up the vinegar in the recipe being that the ribs were already in a sweet rub, so I wanted the sauce more acidic than sweet. 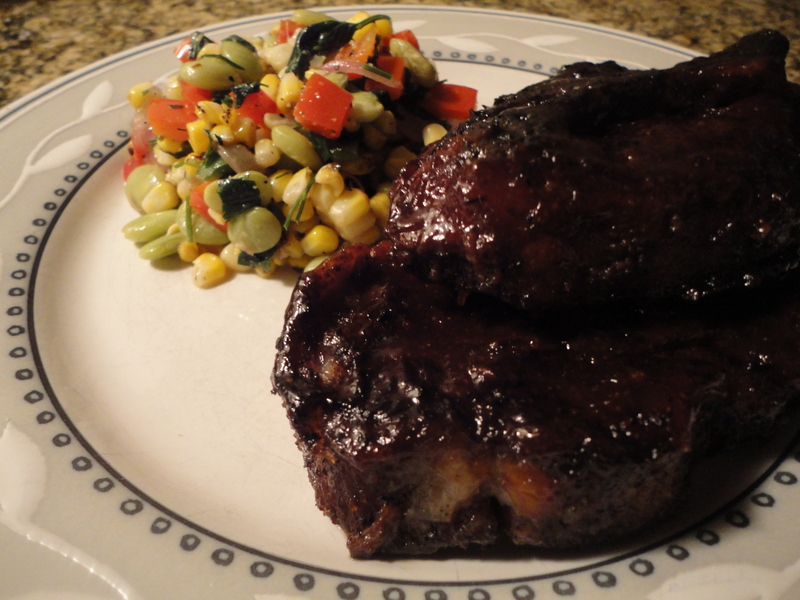 Put your sauced ribs on the grill for 30 minutes, carefully turning them halfway through… and that’s it. Your done! Delicious, juicy, fall off the bone ribs in three hours. Crack open a beer or a big ‘ole red wine and enjoy! Tags: country style ribs, grilling, perfect pairings, perfect pairings at home, ribs, summer, three hour ribs. Bookmark the permalink. Yummo. I love ribs. Start them in the oven. The rub, then the sauce. Genius.